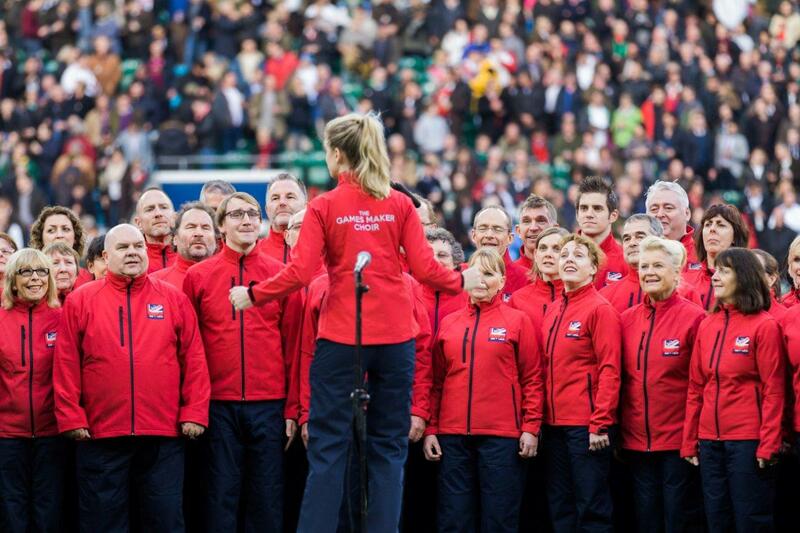 On Saturday 4th August, The Games Maker Choir, who formed at the London 2012 Olympics, made a special appearance at the Semi- Finals of the Vitality Hockey Women’s World Cup at Lee Valley Hockey and Tennis Centre on Queen Elizabeth Olympic Park. At this highly anticipated event and stunning hockey venue, and in soaring temperatures, the 60 strong choir performed songs to the crowds of 10,500 for the sell-out matches, and national anthems, before the games of Ireland v Spain and Netherlands v Australia. Fans also watched the live action on the Big Screen from Fan Central with friends and family and there was loads to do,with hockey legends, food and drink and a mini hockey pitch to pick up a stick and give hockey a go! 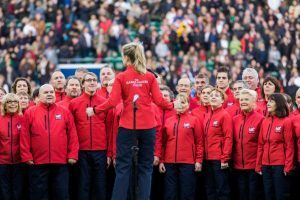 The Choir was founded by Victoria Verbi at the Queen Elizabeth Olympic Park, to harness the amazing spirit of the 70,000 Games Maker volunteers and have some fun in the process. Six years on the choir is now the go to “Choir for Sport”, with 100 members who rehearse regularly in SW London with people travelling from far and wide to perform at some of the nation’s biggest sporting events. In 2017 the choir had the honour of opening The World Athletics Championships at The London Stadium to a global TV audience of millions. They have also performed at The Rugby League World Cup at Wembley Stadium and as well as Rugby World Cup and Premiership Double Header at Twickenham, the Tour de France in Trafalgar Square, Sport Relief at The Olympic Park, The Commonwealth Games in Glasgow and Help for Heroes in Horse Guards Parade. As a fantastic legacy from London 2012, the choir’s performances continue to surprise and delight worldwide sporting audiences. If you sing and have volunteered at major sporting events why not join us?